The traveling teapot stayed home today. But it was put into commission as a friend came to visit. Sharon stopped by on her way home from work, to spend an hour or more chatting as we relaxed on sofa and chair. It was truely an afternoon tea. Duchess Genevieve teacups and saucers blended beautifully with the traveling teapot and its beautiful rhapsody of blue. A lighted oil lamp and a votive candle provided a soft glow on the low sofa table. Star-sliced apples dipped in cinnamon and stevia were paired with dark chocolate-chili pieces and tiny strips of fruit leather. 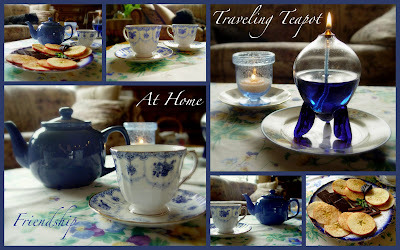 A full-bodied French blend tea filled the little blue teapot. Together, Sharon and I enjoyed our tea and sweets. Long-time friends, we shared joys, sorrows and tidbits of our lives. Quaint and cozy, our tea experience was a simple respite in a week with its own stress and worry. What a simply lovely way to celebrate the day with the traveling teapot. It has stories to tell.